Ian Cathro admitted to mixed feelings at losing key Hearts midfielder Arnaud Djoum to Cameroon, but backed the player to star in the Africa Cup of Nations. The tournament begins in Gabon today and Djoum is part of a 23-man Cameroon squad. They face Burkina Faso in Libreville in their opening group fixture this evening at 8pm (7pm UK time). As a result, Djoum could miss several key matches for Hearts over the coming weeks. He will definitely be absent for next weekend’s Scottish Cup fourth-round tie against Raith Rovers at Stark’s Park. 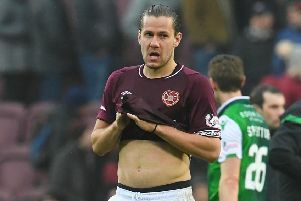 Should the Indomitable Lions progress to the knockout phase, he could still be unavailable for Hearts’ upcoming league fixtures against Celtic, Rangers and Motherwell. Head coach Cathro is delighted to see the 27-year-old involved in such a prestigious competition and expects him to shine amongst Africa’s best. However, he conceded he is a difficult man to replace in the club’s midfield. “I think he’ll do well over there,” said Cathro. “I’ll be keeping in touch, watching his games and wishing him well. I hope he stays safe and returns to us maybe with another little bit of motivation to push hard for the second half of the season. “Naturally, there are mixed feelings on it. Arnaud is a player I don’t want to be missing. He has shown great work and really good qualities so far. I’m excited to see more from him and see how he can improve even more, which I really believe he will here. “At the same time, I do understand the importance for players to go and represent their country in this tournament. It’s a really good opportunity for him so I’m really pleased for him. Faycal Rherras received a late call-up to the Morocco squad on Thursday, although the defender, who has been in and out of the Hearts team in recent games, is unlikely to be missed as significantly as first-choice attacking midfielder Djoum, especially since Cathro moved to recruit left-back Lennard Sowah earlier this week. Cameroon are in Group A alongside hosts Gabon, Burkina Faso and Guinea-Bissau, while Morocco are in Group C with Ivory Coast, DR Congo and Togo. Hearts fans keen to monitor the progress of Djoum and Rherras can watch all Africa Cup of Nations matches live on British Eurosport and British Eurosport 2.